It’s just after the Bills season has come to an end….and all I keep thinking about is….how did a Bills-Jaguars Thursday Night NFL Network only, hide-it-so-no-one-really-sees-it game, wind up in the playoffs? These are two flawed teams, who really were not playoff caliber. But this down year in the AFC (Texans injuries, Chargers bad kicker, Raiders implosion, Ravens collapse) made them postseason-worthy, even if there was very little about them that passes the playoff eye test. For the Bills, the 10-3 loss looked a lot like a lot of their games this season. Not generating a single touchdown in a playoff game is an embarrassment, but not all that out of character for one of the league’s worst offenses. *Tyrod Taylor: He once again proved he is not good enough to beat any kind of formidable opponent. 17/34, 114 yards and a 44.2 QB rating is typical Tyrod. Three times in the fourth quarter, he was asked to be an NFL quarterback and take his team to a game-saving score. He couldn’t do it. He’s now 2-14 in his career when throwing more than 30 times. His miss of Nick O’Leary in the end zone on a post route is the one that sticks with me. You have to make that throw. His legs generated some offense, but that’s only because he could not/would not get rid of the ball. It was sad to see him leave with an apparent concussion, but I suspect that image of his walking to the locker room will be the final one we see of him in a Bills uniform. *Nathan Peterman: For a second, you thought he might be able to do what Taylor couldn’t: Take the Bills down the field for the tie score. But then, his lack of arm strength was displayed with the out pass that Jalen Ramsey jumped for the interception. *Bills Receiving Weapons: You aren’t going to win with Deonte Thompson and Zay Jones as your main weapons in the passing offense. Throw in having to play Logan Thomas, and having his lack of talent lead to an interception, and it underscored the woeful makeup of the passing attack. Thompson and Jones each could not make crucial catches that might have changed the game. Kelvin Benjamin’s offensive pass interference penalty was a pivotal play in the game. *Goal Line Offensive Play Calls: I won’t go crazy on the play calls from the goal line. The Jags run defense is very good. So let’s stop assuming that a run on first down would have scored a TD. You got Benjamin for exactly those plays. He just needs to not commit the penalty. After the game, though, Sean McDermott admitted he’d like to have that play back. That’s not a good sign for Rick Dennison’s future. 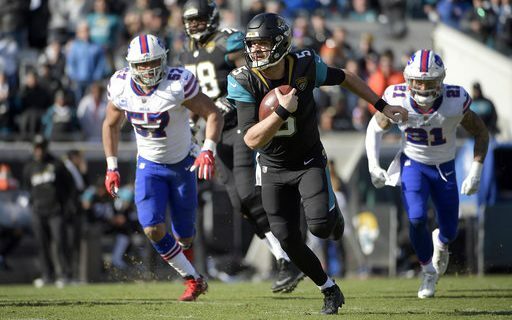 *Blake Bortles Running: His 88 yards rushing were a career-high, and one more than he passed for. No one could have expected that Bortles’ legs would be the difference in the game. Give him credit for seeing the opportunity to gain yards that way, because nothing else was working. *Blake Bortles Passing: How bad was this? He made Tyrod look good as a passer. I have never seen an NFL quarterback miss so many easy, normal NFL-like thrown. Screens, dumps, outs. He couldn’t complete any of them. So that’s why it’s so shocking that the game was decided on a Bortles pass for the touchdown. *Lesean McCoy: Good for him, gutting it out with an injured ankle. His numbers (75 yards rushing, 44 yards receiving) were on par for a healthy Shady game. Early, I thought he wasn’t running with the same flair and spirit we’re used to. That limited his gains in the first half. But after that, he looked good. Problem was, the Jags were ready for him and wouldn’t let him decide the game. *Bills Defense: They did a good job, especially against Leonard Fournette. I can’t believe the Jags didn’t feed him the ball more. But allowing Bortles and his legs to win this game is on them. That should have never happened. Also, we all knew the Bills would need a few takeaways to follow the same model that got them off to a 5-2 start. The defense couldn’t do that, forcing no turnovers from a QB who had thrown 5 picks in the last two games. *NFL Replay: I hate that the two most important plays of the game (Koyack TD, Ramsey INT) had to go through Al Riveron’s millimeter video check system before we could know if they actually were key plays. Tony Romo was freaking out, and getting everyone all worked up because there may have a been a slight wobble or graze of the turf. Please stop this, NFL. When a huge play happens, I want to react. Not have to wait and think. There will be more analysis and reaction from this game in the coming days. Of course, everyone will shift to the offseason starting Monday to figure out the big questions: Will the Bills keep Taylor? Will they go out and get another QB? What will they do with the draft picks? Will Kyle Williams retire? Stay with Buffalo Sports Page for all of your offseason coverage.